Former Australia cricket vice-captain David Warner Thursday said he will not be challenging his 12-month ban for ball-tampering and would strive to be a better teammate and role model. His decision, just hours before a deadline, followed a contrite Steve Smith and Cameron Bancroft also accepting their sanctions on Wednesday. Warner and Smith were last week suspended from international and domestic cricket for a year, while opening batsman Bancroft was exiled for nine months over the incident during the third Test in South Africa that shocked the sport. The trio had until late Thursday to tell Cricket Australia whether they accepted their punishment or would opt for a hearing, as is their right. 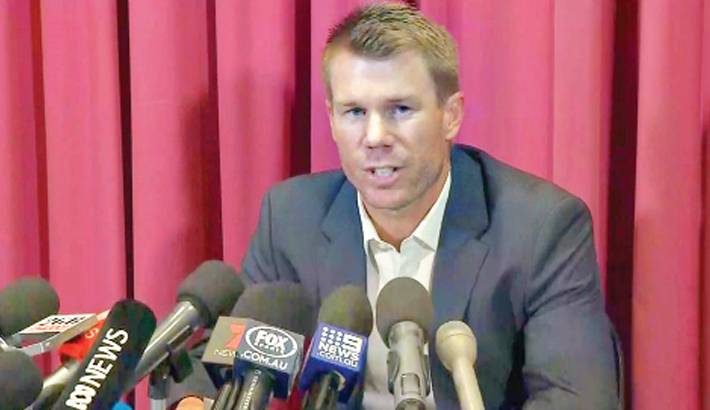 “I have today let Cricket Australia know that I fully accept the sanctions imposed on me,” Warner said on Twitter.